Chapter 3 Page 20 is up. Snow-by-Night returns to Father Winter. In case you didn’t see my comment on Friday’s Almanac entry, I just had another article published by Wizards of the Coast for their Dungeons & Dragons brand. It’s a description of Suzail, the capital of Cormyr in the Forgotten Realms. You can download the article here. You do have to be a member of D&D Insider. 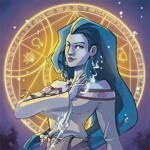 To see a preview of Snow-by-Night receiving her manifestation, vote for Snow by Night on Top Web Comics. Everything makes sense now! Wow, I’m so excited! So, she must find her hidden heart, and enough shinny things to pay her debt to Chugan. Maybe our heroes agree in helping her in exchange to joining their band temporally. *innocent whistling* You’ll have to read and find out. Brittany is over there giggling at Blaise and Jassart’s reaction to the manitou’s story. Don’t find your heart! Yikes–suppose you fall in love and the next second, whoosh you’re gone for eight score years! Baaaad feeling about this . . .